Minna Sundberg, creator of the marvelous and magical webcomic A Redtail's Dream is back with a new webcomic, and this time she's destroying the world. What begins as mysterious rash ends up radically altering Northern Europe as we know it—but what is lurking in the woods outside the human settlements? Sundberg has a remarkable ability to balance the charming and the creepy, and that talent is present from the opening pages of Stand Still, Stay Silent. There is the ominous text, "Year 0, Day 0, Norway," leading into a scene in which folks are discussing their flooded roads and the rash illness spreading through the country. But the tone is light; folks are discussing taxes and making fun of one another. Sundberg gradually swings the camera around to different places and different groups of people, all of whom are trying to deal with the outbreak and the accompanying government shutdowns in their own ways. They are vaguely concerned about the illness, which hasn't been fully explained by medical professionals, but they're also worried about keeping their jobs, about their relationships, about everything they think they'll need to do in the coming weeks. Sundberg introduces the characters in Stand Still, Stay Silent in much the way she does in A Redtail's Dream, with a bit of cheeky text that gives us a little insight into the character's personality. But the implication is clear: These people may not survive to the next chapter. We may never hear about them again. While for a few pages, they may be the most important people in the comic, their significance is fleeting. But Stand Still, Stay Silent isn't a comic about the destruction of the world. We aren't simply going to watch the world fall apart; we're going to see how humans have adjusted to the new status quo decades later. Iceland, Norway, Sweden, Denmark, and Finland have all formed distinct civilizations based on their geography, language, history, and traditions—and what happened to them during the initial outbreak. But the world hasn't yet been reclaimed by humanity; there is something dangerous lurking in the forbidden zones, and chilling admonitions to travelers who would venture there. 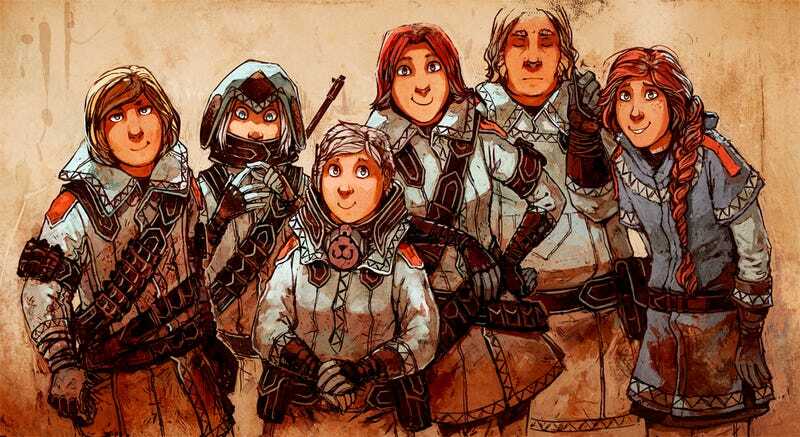 What's especially remarkable about Stand Still, Stay Silent is that Sundberg has managed to create an engrossing comic when she hasn't yet introduced us to our main cast. She has just ended the comic's rather beefy prologue, one that drops some intriguing hints about this post-apocalyptic world and invites us to plumb its secrets.